We have all heard about the dangers of second hand smoke and what it can do to our hearts, lungs, and blood vessels. It was because of this proven danger to our health that smoking indoors has been banned for years in public buildings, office buildings, government buildings, and, in 2006-2007, restaurants and bars had a complete ban placed upon them as long as it was inside the premises. Smoking is still allowed on outdoor patios adjacent to restaurants and bars. Recently, however, a researcher from Johns Hopkins University conducted a study on outside bar patios in Montreal, Canada. Professor Ryan Kennedy found that the tests he conducted on the patios indicated second hand smoke could also pose a health problem to people even on a breezy day. “Even if a patio is completely uncovered … smoking on a patio can generate very high concentrations of fine particles—those which penetrate deep into the lungs,” said Kennedy. The anti-tobacco advocates have been quick to use the results of this study as a way to further their agenda of a complete ban on smoking inside or outside of restaurants and bars. The study shows that the particulate matter emitted from a lit cigarette can create air quality comparable to a smoggy day in Los Angeles. On the other side of the argument, the president of the Quebec bar-owners union rejects the study conducted by Dr. Kennedy and plans to conduct their own study. Meanwhile, the issue will be scrutinized further by the Quebec government in late summer. It will be interesting if Quebec decides to ban smoking in outdoor areas much like the provinces of Newfoundland, Nova Scotia, Yukon, and Alberta have. The city of Toronto Health Board has already made recommendations for a complete ban on smoking which would extend to outdoor areas. Ottawa, the capital city in Canada, has already done so. My comments are somewhat echoed in the quote from Dr. Kennedy. “I think what’s important is for us to remember that tobacco smoke is a Class A carcinogen, and any level of exposure bears risk,” he said in an interview with The Toronto Star. The fact remains that second hand smoke is dangerous to human health and patrons or staff who are in the patio areas and are exposed to it. How many times have you sat out on a patio for some food or a drink and had second hand smoke wafting past your face? The issue here, in my opinion, is not about rights at all. The issue is a health issue and in that sense, second hand smoke poses a significant health risk even in an outdoor patio where the particulate matter can be inhaled. In my opinion, nobody should have the right to inflict harm upon anyone else, whether it’s from second hand smoke or another noxious substance. 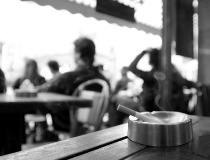 The research has clearly shown that businesses are not adversely affected by smoking bans. Quite to the contrary, their businesses have been able to thrive as the majority of people are non-smokers and want to be in a smoke-free environment. “Harmful levels of second-hand smoke found on Montreal patios,” CBC News web site, August 3, 2013; http://www.cbc.ca/news/health/story/2013/08/03/montreal-anti-tobacco-advocates-deman-patio-ban.html, last accessed August 7, 2013. Levinson, R., “Second-hand smoke a risk even on patios, says study,” Toronto Star web site, August 3, 2013; http://www.thestar.com/news/canada/2013/08/03/secondhand_smoke_a_risk_even_on_patios_says_study.html, last accessed August 7, 2013.